I participated in a campaign on behalf of Mom Central Consulting for Healthgrades. I received a promotional item as a thank you for participating. Choosing a doctor is such an important and difficult decision. You need to do all the research you can before choosing a practice and doctor. When I found out I was pregnant with my first I did my research and found the best doctors in the area. I am so happy with my decision for our obstetrician because neither of my pregnancies were very easy – with Pinky I had preeclampsia and with Loo Loo I had gestational diabetes. I was insanely swollen with Pinky, my legs were like tree trunks so much that my ankles were pretty much non-existent. You can tell in the pic (I can’t believe I’m posting this pic!) from our baby shower, eek! I’m very glad they took great care of me and really took the time at each appointment to ensure my babies and I were getting the best care. I learned my lesson about doing my research before choosing a doctor when I was in college I chose my primary care physician and have gone there since but recently I feel like the practice has grown too much too fast and the level of care and personal time with each patient has greatly suffered. When I started going to this doctor they took lots of time with me asking me all sorts of questions and getting into detail so there was nothing missed. However, my last visit it felt rushed. Then my husband who chose my doctors as his primary care doctor went in and got the same vibe. Rush, rush and get you out the door. I get that they are there to make money but my husband and my own health is supposed to come before that, right?! That is why when we made the decision to switch our primary care doctors I again turned to Healthgrades. There I could search for any general practice or specialist and get reviews and learn more about the doctor and his or her history. I’m happy to say that we are very happy with our new physician and feel like they take the time they should with us instead of looking at us as just another patient to quickly move in and out the door so they can move on. It’s very important to be an advocate for your healthcare. Not only because you need to take care of yourself but if you have children you need to set an example for them so that when they take charge of their health. When you choose a hospital or doctor, do your research because it could be the difference between life and death. For example, in a 5-star rated hospital you have a 75% lower of dying and 61% lower risk of having a complication. For more details on why women should take charge of their healthcare read up on the Healthgrades’ 2013 Women’s Health Report. Have you had a bad experience with a doctor? 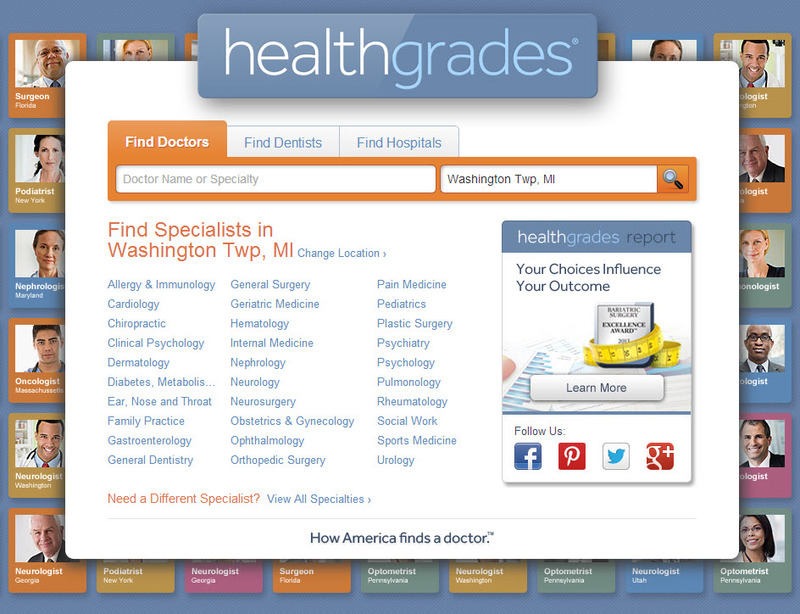 Have you used Healthgrades before? Thank you for this! We just moved and I need all new Doctors and Dentists for us! This is a great tool that will enable many people to get better medical care for themselves and their families. I’ve never used Healthgrades. Because of my job I’m stuck with a provider whether I like him/her or not. This is great if you get to choose your provider. Will have to tell a few people about it. It’s always great choosing your own provider. We are pretty fortunate to have great healthcare. I hope you do like your doctor, that would be hard not to have a choice! I have never seen this service before. I am very happy with my physician but I will bookmark this information to pass on to family and friends. Thank you. HealthGrades sounds awesome! We will be moving soon, so I will definitely be looking for a new doctor, and I want one that will actually listen to me! Best of luck on your move and finding new doctors. Finding one that listens is so important, after all we know our own bodies better than anyone! I’ve never used healthgrades before. Now I know where to check before I have anything important done! You hit it with this – “Choosing a doctor is such an important and difficult decision.” It is so hard to choose a doctor. You are trusting this person with your information and life. It’s good to read what others say before making such a vital decision. It is isn’t it? You need a doctor that wants to listen to your concerns because it could make all the difference!